A young, glittering collection of stars looks like an aerial burst. The cluster is surrounded by clouds of interstellar gas and dust—the raw material for new star formation. The nebula, located 20,000 light-years away in the constellation Carina, contains a central cluster of huge, hot stars, called NGC 3603. Ayoung, glittering collection of stars has been caught in the act of a dazzling celestialfireworks show, in a newly released photo taken by the Hubble Space Telescope. The new Hubble space photo, which shows a nebula 20,000 light-years away in the constellation Carina, contains a central cluster of huge, hot stars called NGC 3603. Thisstar cluster is surrounded by clouds of interstellar gas and dust ? the rawmaterials needed to form new stars. Whilethe stunning photo may look serene, the environment is actually quite volatile.Ultraviolet radiation and violent stellar winds have blown an enormous cavityin the bubble of gas and dust that envelopes the cluster. Coincidentally, thisgives Hubble an unobstructed view of the star cluster's heart. TheHubble science team released the photo Tuesday, though it was actually takenduring several observations between August and December of last year. 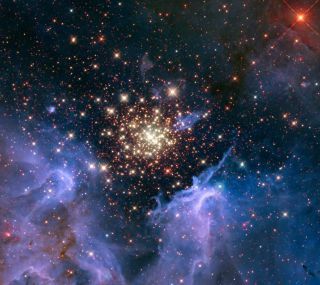 Starclusters like NGC 3603 provide crucial information that helps astronomersunderstand the origin of massive star formation in the early, distant universe. Mostof the stars in this cluster were born around the same time, but they differ insize, mass, temperature and color. Sincethe course of a star's life is determined by its mass, star clusters of a givenage allow detailed analyses of stellar life cycles, as they contain stars invarious stages of their lives. NGC3603 also contains some of the most massive stars known. These stars live fastand die young, rapidly burning through their hydrogen fuel and ultimatelyending their lives in spectacular supernova explosions. Astronomerscan also use massive star clusters to study distant starbursts that occur when galaxies collide. These cosmic impacts set off aflurry of star formation. The proximity of NGC 3603 makes it an interestingcase study for examining such distant and momentous events. Theimage of NGC 3603 was captured by Hubble in August 2009 and December 2009 withthe telescope's Wide Field Camera 3 in both visible and infrared light. TheHubbleSpace Telescope has been observing the universe for 20 years. It waslaunched in 1990 aboard a NASA space shuttle and been overhauled several timesby astronauts on later flights.